Released in 1912, The Lost World tells the tale of Professor Challenger's expedition to a mysterious plateau in the Amazon basin of South America. Professor Challenger and his team of explorers discover the plateau is still inhabited by prehistoric animals, including dinosaurs, and soon become embroiled in an ongoing war between the indigenous people of the plateau, the Accala, and a vicious tribe of ape-like creatures, the Doda. This was a passion project for artist and Vice Press co-founder Matt Ferguson who has wanted to interpret Conan Doyle's forgotten world for a long time and with the support of the Conan Doyle Estate, we are delighted to realise Matt's vision with this gorgeous limited edition screen print. 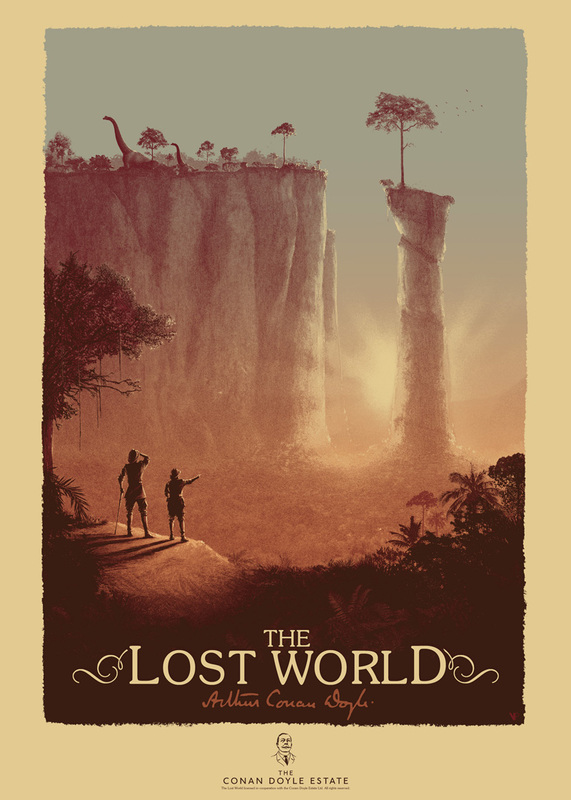 The Lost World by Matt Ferguson will be available to purchase from vice-press.com on Tuesday the 4th of July at 6pm BST. The release is a 4 colour screen print and comes signed and numbered in an edition of 100, printed on 100# French Cement Green by Lady Lazarus press. The print measures 50cm x 70cm and will be priced at £30.